Told in the charming voice of Ted's new pup and illustrated with more than two hundred photos, Pukka tells the story of how Ted met the young yellow Lab, recounting the early days of their bonding as they explore Kelly, Wyoming, and the wider world. Walks become hikes and hikes become climbs, their adventures culminating in a rugged wilderness journey that teaches both Pukka and Ted something new about the dog-human partnership. 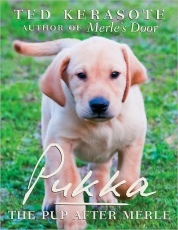 Filled with stunning images of the West, Pukka is a love story as well as Ted's take on raising a puppy. It will do pictorially what Merle did with words -- show how dogs thrive when treated as partners, while illustrating the many ways that any dog can open the door to our hearts.